Alibaug is a coastal town located in the Raigarh district of Maharashtra. The place was developed in the 17th century by Sarkhel Kanhoji Aangre, who was the naval chief of Chatrapathi Shivaji's empire. The seaside town is located at a distance of about approximately 100 km from the city of Mumbai and is a very popular weekend getaway for those from Mumbai and Pune. The place is home to a number of serene and beautiful beaches and is well known for its breathtaking calm weather and dense coconut groves. Apart form its beaches, the place is also well known for its many historical and grand temples which are found in the region.Taking a walk amidst the dense and refreshing coconut groves gives one a very enchanting and relaxing experience if you are looking forward to some amount of solitude. One of the best ways to reach Alibaug is by road. The town is well connected by roads and there are regular buses which operate from major cities to Alibaug. Best Time To Visit Alibaug: Alibaug is a year round destination. The total driving distance from Mumbai to Alibaug is around 92.6 km. There are three routes that can be taken to reach here. Those who want to opt for Route 1, it would take you approximately around 2 h 45 min to reach Alibaug, via NH 166 A . The route takes you through the well-known towns of Navi Mumbai, Pen, etc. The roads are well-maintained, which helps one to cover the distance at a good pace and the distance is about 92.6 km through this route. If you opt for Route 2, it would take you approximately 3 h to cover a total distance of 95.4 km from Mumbai to Alibaug, via NH 66. On Route 3, it would take you around 3.5 h to cover the distance of 121 km, via the Mumbai-Pune Highway to reach Alibaug. Pen can be an ideal stopover for some delicious breakfast; after a filling breakfast, one can go around the place. The town is well known for the making of Ganesha idols. The place is historically very significant. It is the birthplace of Vinoba Bhave, a well known social reformer, freedom fighter and also the spiritual successor of Gandhi. 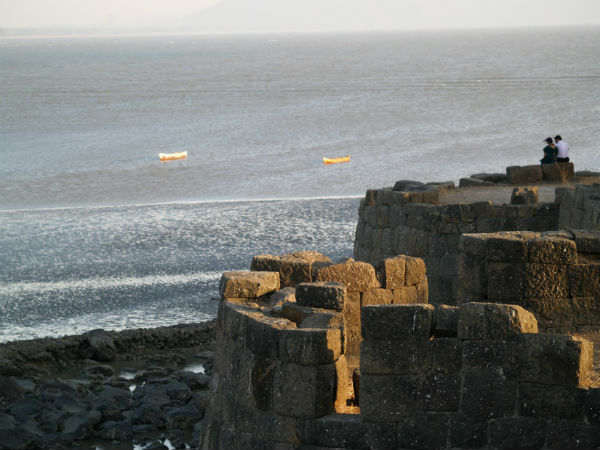 Being a seaside town, Alibaug has quite a number of beaches, islands and heritage structures to go around. Brimming with history and being an important part of the Maratha Empire and the Portuguese culture, this is an ideal place for those who enjoy history and places associated with it as Alibaug has a lot to offer with its forts and its temples. From museums to observatories, this place has it all. Alibaug beach is the main beach here. A very flat stretch makes for a long walk. It is reasonably clean and has thin crowds during the week. The sand has a hard texture and is a shade of black. The best part about this beach is that one can enjoy the sight of the Colaba Fort. Take a short boat ride to the popular fort which gives a magnificent view. There are no second thoughts when it comes to exploring the fort which everyone loves to try once in a lifetime. The hidden stories of the forts always beckon us to explore these places. The average height of the fort walls is 25 feet and has two main entrances, one on the seaside and the other towards Alibaug. The Someshwar temple is an ancient temple dedicated to Lord Shiva, which is well known for its architectural beauty. The artistic extravaganza displayed on the structure has a history to be told that Satavahana rulers built during the 4th century.